WASHINGTON - The Army's top officer, General George Casey, told Congress yesterday that his branch of the military has been stretched so thin by the war in Iraq that it can not adequately respond to another conflict - one of the strongest warnings yet from a military leader that repeated deployments to war zones in the Middle East have hamstrung the military's ability to deter future aggression. Officials said Casey, who appeared along with Army Secretary Pete Geren, personally requested the public hearing - a highly unusual move that military analysts said underscores his growing concern about the health of the Army, America's primary fighting force. Casey, a member of the Joint Chiefs of Staff, wanted a public forum even though he has ample opportunity to speak to lawmakers in closed-door meetings. Representative John M. McHugh, a New York Republican, said Casey's blunt testimony was "just downright frightening." Meanwhile, Secretary of Defense Robert Gates asked Congress for a record-setting $190 billion to continue the wars in Iraq and Afghanistan for the next year - nearly $50 billion more than anticipated. Most of the money would go to Iraq. If the request is approved, the cost of the 2003 invasion will top $600 billion. Gates's request is expected to include $17 billion to manufacture thousands of new, heavily armored vehicles designed to withstand the lethal blasts of roadside bombs, the biggest cause of US combat deaths. Seeking to head off Democrats' maneuvers to attach conditions, including troop withdrawals, on an Iraq spending bill they will send to President Bush, Gates urged the Senate Appropriations Committee "to approve the complete global war on terror request as quickly as possible," without "excessive and counterproductive restrictions." But Casey, a four-star general who until earlier this year was the top commander in Iraq, made it clear to the House committee that the costs to ongoing military operations is rising, especially in terms of the United States' strategic position in the world. The strain on the Army has been growing steadily since Bush sent troops into Iraq in 2003 - the longest sustained combat for an all-volunteer American force since the Revolutionary War. The Pentagon and military analysts have documented the signs of the breakdown: serious recruiting problems, an exodus of young officers, and steadily falling readiness rates of nearly every stateside unit. Casey's testimony yesterday sent a clear message: If President Bush or Congress does not significantly reduce US forces in Iraq soon, the Army will need far more resources - and money - to ensure it is prepared to handle future security threats that the general warned are all but inevitable. "As we look to the future, national security experts are virtually unanimous in predicting that the next several decades will be ones of persistent conflict," Casey told the panel, citing potential instability caused by globalization, humanitarian crises, and the proliferation of weapons of mass destruction. Casey's assessment of the Army's preparedness, however, was far more pessimistic than his predecessor's, General Peter Schoomaker, the former Army chief of staff. When the same committee in January asked him about the Army's overall condition, Schoomaker answered only that he had "concerns" about the Army's "strategic depth." Several Pentagon insiders have privately remarked that Casey's apparent alarm about the Army heightened when he returned from nearly three years of duty in Iraq. One civilian military adviser said that Casey was taken aback when informed at a recent meeting that some combat units were heading into battle short of key personnel. After the meeting, the adviser said, Casey took an officer aside and peppered him with questions about exactly which units were affected. Casey and Geren insisted that the units now deployed to the combat zone are highly trained and outfitted with the proper equipment. However, they said the units of most concern are the ones returning from Iraq or those preparing to deploy without all the proper equipment. Stocks of equipment the Army has positioned around the world are also growing low because of the war, they said. Replenishing those stockpiles, Casey told the committee, "will give us back our strategic flexibility." A major risk for the future, however, is that the Army currently spends nearly all of its time training for counterinsurgency operations - "to the detriment of preparedness" for other types of combat, Casey testified. If troops don't continue to train, their skills "will atrophy over time." Army units are now deployed to Iraq or Afghanistan for 15 months at a time. At current force levels, that allows them 12 months or less back home before being sent overseas again. Casey said yesterday that the cycle allows for "insufficient recovery time." Compounding the situation, he said, is the fact that part-time soldiers in the Army Reserve and Army National Guard - considered the nation's backup forces in the event of a major conflict - "are performing an operational role for which they were neither originally designed nor resourced." At the same time, he said, the toll on soldiers' families is even greater, raising serious questions about whether the Army will be able to retain its best soldiers. In the six months he has been Army chief of staff, Casey said that he and his wife have talked extensively with commanders and Army families about the pressures of repeated tours. "It was clear to us the families are affected," he said. "It's cumulative." 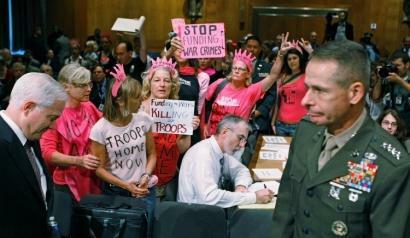 But he warned that the Pentagon's current system can not sufficiently support the troops or their families. "Army support systems including health, education, and family support systems are straining under the pressures from six years of war," he said. Given enough resources, Casey predicted, it would take at least three to four years to restore the Army to full strength, including replacing damaged or destroyed equipment, adding tens of thousands more soldiers, and increasing health and other benefits for Army families coping with frequent deployments of loved ones. But committee members wondered if there is enough time. "This is foremost a question of strategic risk," said the committee's chairman, Representative Ike Skelton, a Missouri Democrat, noting that the United States has used military force on a dozen occasions over the past 30 years. "In most cases the United States was forced to act with little warning. It will happen again; later we hope, but undoubtedly sooner than we'd like."